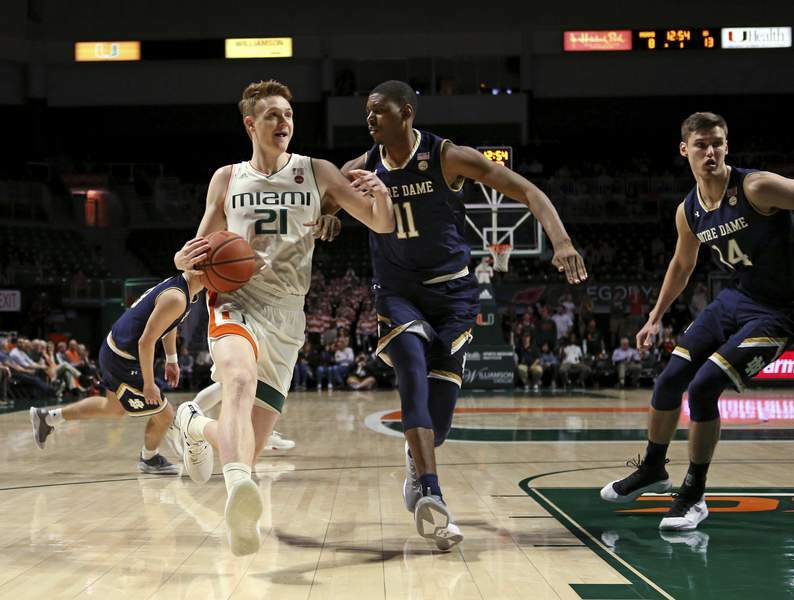 Associated Press Miami forward Sam Waardenburg (21) drives against Notre Dame forward Juwan Durham (11) during the first half of an NCAA college basketball game, Wednesday, Feb. 6, 2019 in Coral Gables, Fla.
Anthony Lawrence had 11 points, 12 rebounds and two steals for Miami, while Ebuka Izundu made all seven shots for 14 points and added seven rebounds. Izundu was shaken up and briefly left the game with 15 minutes left but returned. Notre Dame's John Mooney had 11 points and six rebounds — the first time in nine games that he failed to achieve a double-double. The Hurricanes used a mix of zone and man-to-man. They forced 14 turnovers, which led to 16 points. Miami also had a rebounding advantage and a 16-6 edge in second-chance points. The Fighting Irish made five of their first six shots to grab a nine-point lead, but then cooled off. They went 8½ minutes without a basket midway through the game as Miami outscored them 16-2 to take a 34-23 lead. A layup by Chris Lykes gave the Hurricanes their biggest advantage, 51-33. Miami's Lykes had 11 points to win his matchup with Notre Dame freshman guard Prentiss Hubb, who shot only 1 for 7. They were high school teammates in Washington. Miami pulled ahead in the series, 12-11. The schools meet again Thursday when Notre Dame's No. 4-ranked women play at Miami. The Hurricanes play Saturday at No. 8 North Carolina, which beat Miami in January. Notre Dame plays at home Sunday against Georgia Tech. The Yellow Jackets won when the teams met last month.